"Sometimes it's hard to understand the drift of things. This was a good boy. He'd have been a good man. He didn't get his chance. Death can come for you any place, any time. It's never welcomed. But if you've done all you can do�and it's your best�in a way I guess you're ready for it. " I was always more of a rubber-suited monster fan, but I never ever turned down the chance to see a movie in a theater, and though I was not what you'd really call a western buff, in the dark of the theater I dug the cocky swagger of John Wayne. It was hard not to. My dad took me to see yet another Wayne movie in 1972�The Cowboys�and in the decades since, as I have drifted around the genre as a whole, it is this one that has stuck with me as one of the first I think of when I think "western." Wayne's crotchety Wil�one character tells him "if your neck was any stiffer you couldn't bend over to put your boots on"�is getting on in years, and having to rely on the boys is both alien and necessary to him. 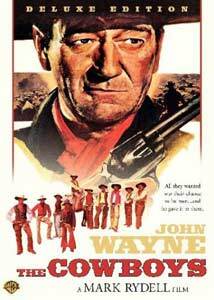 Yet it's one of those cinematic "circle of life" moments, where what Wil ultimately passes on to the new generation is critical, lifesaving stuff�and though John Wayne never turns into an old softie by any means�he does become something of a proud, towering father figure to the young brood. The boys do more than just play cowboy by the time it's all said and done, and Rydell's ability to eventually upset the moral apple cart is what gives his film a freshness that is sadly lacking in most big-star studio projects of the time. The thing to remember is that The Cowboys isn't just another macho John Wayne vehicle, where secondary players orbit silently around a giant star until it's time to utter a line or two. First, there's those boys�not all trained actors�who all seem like real, sometimes scared humans, not shrill line readers. That's so essential here that I've often wondered if Rydell realizes how lucky he is, because the film could easily have crumbled if this had turned into an annoying-kids-trying-to-upstage-The-Duke feature. Roscoe Lee Browne's trail cook Jedediah Nightlinger gets to deliver one of the most stirring blocks of dialogue in the entire script, and he continually breathes life into a character that could easily have been a faded Hollywood stereotype. Dern's shifty and violent Asa Watts is easily one of the better genre badasses to have come along in a long while, and he is so much more than just an irritant to be offed in some dramatic showdown. He's genuine bad news, a real dangerous type that�to a 12-year-old me sitting in the theater�is a palpable threat to be reckoned with. All of you western purists can no doubt argue about the greatest genre title�but I do know that The Cowboys made a lasting connection with me, and I haven't been able to shake it in 35 years. And in revisiting it via this deluxe edition, I've been reassured that everything I remember about it is true. Image Transfer Review: An impressive 2.35:1 anamorphic widescreen transfer from Warner, made especially enjoyable by a steady palette of deep, vivid colors and warm, natural fleshtones. I can't really stress how bold the colorfields are here, and for a film from 1972 this one really looks outstanding. Edges are fairly crisp and well defined, though some of the big vista shots reveal some edge enhancement and a wee bit of grain, but hardly enough to sink this one. There appears to have been some major restoration work done here, as The Cowboys looks almost brand new. Audio Transfer Review: The main audio track is a new Dolby Digital 5.1 surround mix, remastered from the original mono. Not much in the way of surround channel usage, but the enhanced soundstage gets painted nicely across the front three channels, where elements like the John Williams score sounds particularly crisp. The bottom end lacks a little overall, but there's a wide, spacious feel and the clear voice quality gives new life to Rydell's film. A French mono dub is also included. Extras Review: This new deluxe version comes in a slipcase that closely matches the DVD cover art, though there is a larger black border on the inside cover. Inside is a cool plus, a set of eight 5x7 black-and-white production photos, printed on heavy stock. These are high quality prints, and make a very nice bonus. I'm not what you would call a fan of the western, and this one is hardly standard issue for the genre, but it made a big impact on me when I was 12 and it still plays exceptionally well. The Cowboys is great bit of family entertainment, with The Duke forced to hire a bunch of inexperienced young boys to help move his cattle more than 400 miles. This deluxe edition carries a new half-hour reunion doc, a Mark Rydell commentary and a set of eight high-quality black-and-white stills.